Sara advises clients on permitting and litigation related to energy infrastructure development, clean-up sites and dangerous waste permitting. She has experience with issues related to utility permitting; endangered species; the Washington State and National Environmental Policy acts; the Model Toxics Control Act; clean water; complex environmental litigation; and environmental, health, and safety compliance matters in Alaska and Washington State. She enjoys working with teams of experts to counsel clients on the permitting of energy projects ranging from high voltage transmission lines to solar and wind developments to onshore and offshore natural gas facilities. Sara’s practice also includes advocating for in-water projects, including an LNG fuel terminal, offshore natural gas facilities in Alaska, and hydroelectric facilities. 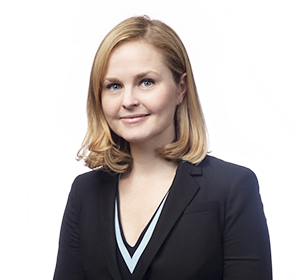 Prior to joining the firm, Sara externed for the U.S. Department of Justice, Environment and Natural Resources Division, and served as a Policy Director at the Oregon Environmental Council. While in law school, she was the Chief Articles Editor of the Washington Law Review and completed focused research on the impacts that economic systems have on the development of environmental law. Lead counsel for Puget Sound Energy in litigation challenging denial of permit for the construction of a transmission line and co-lead on shoreline permit and Clean Water Act Section 401 permit appeals related to a liquefied natural gas facility. Advises Georgia-Pacific in the Western Port Angeles Harbor MTCA sediment site.